You are currently browsing the The Pet Product Guru blog archives for August, 2010. Tips for buyers or renters with pets. 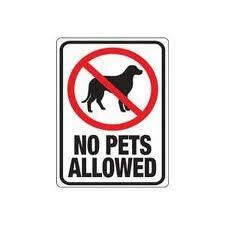 Don’t bother with places that don’t accept pets, just move on! Moving into a new home is always exciting and the best gift that you can give yourself unless of course your new landlord, condo association, or co-op board is reluctant to accept pets. As a former Real Estate agent, I can’t tell you how frustrating it is here in northern New Jersey when you have a client who has a pet. Lets face it, pets are a part of our lives, don’t let me get into it but I really can’t stand it when our pets are discriminated against. It’s really ashamed that many people give up their pets because they are not allowed in their new home. Would give up your child if they were not allowed? How these people could do such a thing is beyond my imagination! 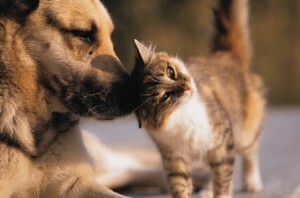 Now lets get to some ways which may help a landlord feel more comfortable in allowing your dog or cat. For example, you could offer to sign an agreement and pay a pet damage deposit. (This will usually not work in a co-op or condo where their rules are written in stone!) It may also help to bring up the subject of pets in person with the individual landlord rather than with the property management company. Remember that’s if the property allows pets. If not, look for another property. 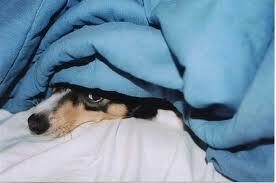 It may take more time but don’t bother with condo’s or co-ops that do not allow pets – just pass those by – no loss! When discussing your pet, be prepared to promote yourself as a responsible pet owner. Tell your landlord that your pet is always on his dog leash and that you always clean up after him. If possible, get references from your previous landlord, neighbors and your veterinarian. Good luck. Don’t give up your pet, he should be a part of your move as he is not a piece of furniture!! Cats need lots animal based protein. The protein in dry food is basically plant based while the protein found in wet cat food is primarily meat based. For this reason and hydration purposed which I’ll explain later, I feed my cats a combination of the two. A vet once told me to feed my cat at one time then take away his food and just leave him with a bowl of water until the next feeding. He said this so that the cat would not get obese. 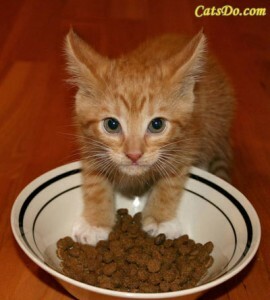 Cats are “nibblers” they eat very small amounts of food at a time, unlike dogs. I did not agree with my vet. What I did was split one small can of wet food with my two cats. Then, later in the morning I give them each a handful of dry food for indoor cats followed by a few snacks in the evening. This seems to be working fine. My older cat is a bit overweight and switching to an indoor dry food, seems to be slimming her down a bit. Cats need plenty of water with their food. It is very important for a cat to ingest water with food. This is because cats don’t have a very strong thirst drive. The lack of a strong thirst drive leads to chronic dehydration when dry food makes up most of their diet. This could lead to all sorts of problems like kidney failure which is one of the most common causes of death in cats. Dry food contain 10% water while wet foods contain 78% water. This is the reason why I give them both kinds of food. Always remember to have their water bowl filled have plenty of cat toys on hand so she gets lots of exercise. A few cat treats every now and then won’t hurt either. Do cats grieve the loss of other cats or human companions? I always wondered if my cats felt a change of loss when I was away or on vacation. My younger cat, Millie always waits for me by the window if I’m not home by a certain time. My older cat, Mollie simply ignores me if I’ve been away from the house too long as if she was mad at me. If you have multiple cats and one cat dies, it has been reported that the owners notice behavioral changes in the remaining cats. These changes could be due to a hierarchy that has been changed or the loss itself. Many cats do grieve the loss of a human companion or grieve the loss of a family dog who dies or goes missing. It’s really not possible to know what cats feel but when a close companion dies or is away, the certainly feel a sense of loss. They won’t mourn the loss as humans do but they’re behavior will change to adjust to the “gap” in their lives. Grief is the result of a sudden or unexpected severing of an attachment. Cats are aware that a companion cat or human is missing and may actually search for that companion. There was a circumstance where the owner of two cats died. The cats were put in a shelter and both cats refused to eat. They were then fostered to a family and the vet gave them some pet medication to reduce stress and stimulate their appetite. One cat recovered but remained very withdrawn for a long period of time the other cat became critically ill due to liver damage from not eating and had to be euthanized. Some animals have actually been known to shed tears when in physical or emotional distress. Cats usually have been known to express their grief by having night mares. My older cat will actually shake and cry out when sleeping. This indicates that she is having a bad dream or nightmare. So, yes I do believe that cats do grieve the loss of their animal or human companion in their own way. It’s very common for a dog to be afraid of thunder but there are ways to help your dog over come his fear. One idea may be to play a CD of storm noises while doing something that he enjoys like playing with his favorite dog toy or eating his favorite treat. You have to be careful not to make the problem worse by rewarding him for his fear. It’s better to distract a whining dog then to pat him. This attention will only re-enforce this kind of behavior. If the problem is severe and behavioral training doesn’t help, have him accessed to make sure he doesn’t have a general anxiety problem. Treatment for anxiety usually involves behavior modification. If your dog is truly terrified whenever there’s a thunderstorm, ask your vet about pet medication that will calm him down. You never know when you might have an emergency with your cat or dog. It’s important to know what to include in a pet safety kit. When it comes to emergencies, it’s very important to have your vets phone number and the National Poison Control hot line within easy reach. Other things that you should keep on hand include a saline solution to flush out your pets eyes, a muzzle in case your pet gets badly hurt and a turkey baster to help get pet medication down. You may also want to include forceps, rubber gloves and soft pet food. You should always be prepared for a potential poisoning. 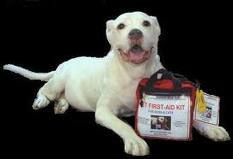 Keep a bottle of hydrogen peroxide in your pets safety kit in case your veterinarian asks you to induce vomiting. Remember that if you do need to take your pet to the veterinarian, you’ll need easy access to a sturdy pet carrier. Your pet may have a passion for houseplants. One of my cats does and loves to nibble on the leaves every now and then. Some common varieties of house plants can make your pet sick. A few may even be deadly. 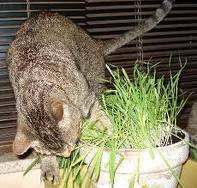 More than 240 types of house plants are considered to be a hazard to pets. It all depends on what part of the plant that the pet eats. For example, the poisonous part of the Amaryllis is the bulb which can cause nausea, vomiting and even paralysis in pets. Other plants such as Crown of Thorn and Cacti only cause skin reactions. Poinsettias also irritate pets although the effects are not as bad as they are rumored to be. If your pet does ingest something that you think is poisonous, do not try to administer any pet medication but call the ASPCA Animal Poison Control Center at 888-4 ANIHELP charges may apply. A dog can be a kids best friend but until your pup gets used to children, it’s very important to know how to keep your children safe around the family dog. A small child is often at a dog’s eye level and their high pitch cries and direct gaze, may trigger aggression in some dogs. Young kids also may pull the dog’s tail or fur. 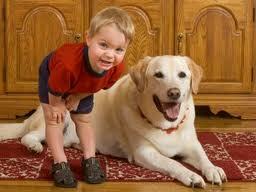 Show your child how to be gentle and respect pets and socialize your dog to kids as early as possible. Take your pup to a playground with the children at a safe distance and reward him with dog treats and praise for calm behavior. Basset Hounds, Golden Retrievers, Collies and Labs are less likely to snap at children. No matter what kind of dog you have always keep an eye on him when the kids are around. 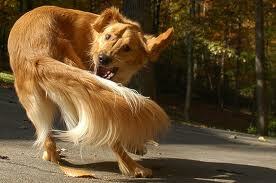 You probably are usually amused when you see your dog chase it’s tail. There really is little harm if your dog tries to chase his tail every once in awhile but sometimes the tail chase could mean problems. If your dog goes after his tail frequently, it could become an obsession and there may even be an underlying behavioral or medical problem. If your dog chases his tail frequently, try to distract him with a dog toy or a command to “sit.” Reward him if he shifts his attention. If the problem continues, consult your veterinarian. He will help you determine whether or not your dog’s tail chasing should be a cause for concern. Cocker Spaniels make very loving pets. However, there are some things that you should know before adopting one of these pets. They require lots of exercise as they are very active dogs. If you don’t give them plenty of exercise, they can become destructive. They can also become destructive if they are left alone for long periods of time. I would recommend that if you’re at work, have someone take them for a walk in the middle of the day. A couple of daily walks plus a weekly run in the park should be enough to keep most Cocker Spaniels satisfied. Cocker Spaniels make excellent family pets and are very accepting of children. In fact, more accepting than most other breeds. They like to play but don’t like to be teased. 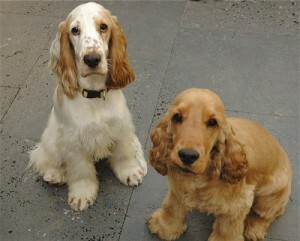 Cocker Spaniels can share a home with other dogs, cats and even small mammals as long as they are socialized properly. The Cocker Spaniel’s hair is somewhat long and they require a daily brushing. An interesting fact about Cocker Spaniels are their tracking abilities. Dozens of Cocker Spaniels get lost each year because of trying to track their previous family or owners. Unless you have a fenced in yard, leaving your Cocker Spaniel off of his dog leash is a big risk. So take the time, know the characteristics of a Cocker Spaniels before adopting one. You’ll be sure to have a wonderful family pet.